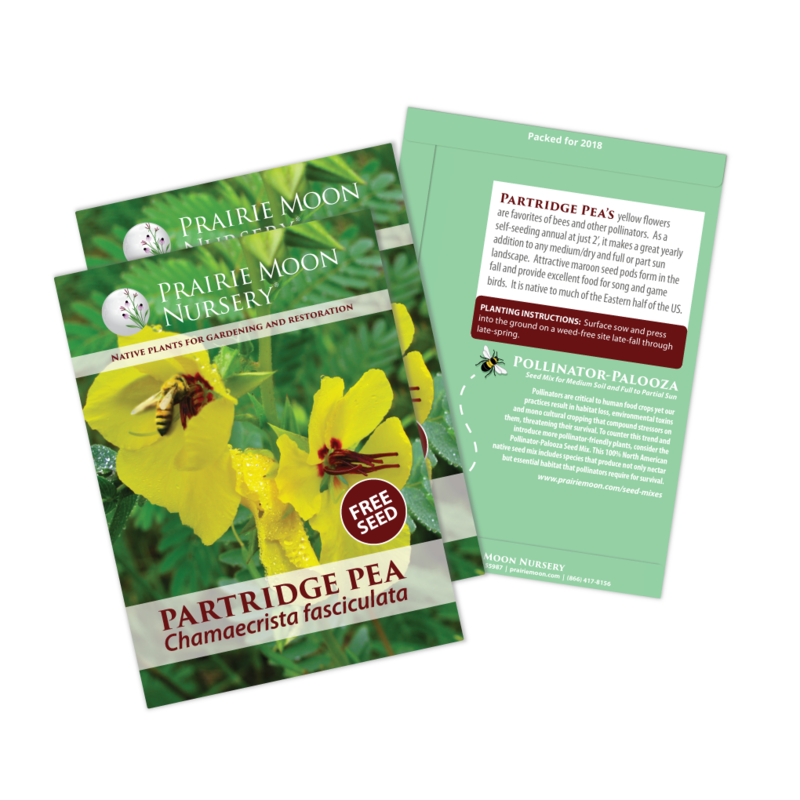 In an effort to contribute to the resurgence of native insect populations, Prairie Moon Nursery will include a free packet of Partridge Pea-Chamaecrista fasciculata seeds with every retail order. No need to mention this offer in your web, mail or phone order! Just look for the free packet to arrive with your order. We love Partridge Pea for its cheery yellow blossom and attractive delicate foliage, but mostly because it benefits all kinds of wildlife. The flowers attract long-tongued bees, the seeds feed birds in the winter months, and the foliage is host to many beneficial insects. Unlike most native wildflowers, Partridge Pea is an annual and it offers a welcome source of color in any newly established planting. Thriving in sunny spaces, this low-growing plant prefers medium to dry soils. It blooms from July through September, and complements native wildflowers like Lead Plant, Blazing Stars, and Sky Blue Aster.